Carrots get a bad rap as a boring vegetable. Yes, everyone knows they’re full of vitamin A and good for eyesight, but in general they’re not seen the sexiest vegetable on the block right now (I’m looking at you kale and cauliflower). However, I believe all vegetables — no matter how boring — can be exciting with the right recipe. 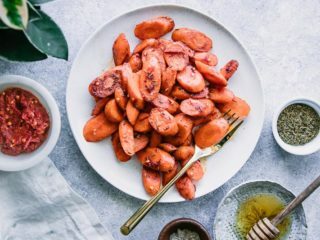 And this sweet and oh-so spicy Honey Harissa Roasted Carrots recipe is EXACTLY what carrots needed to lose that boring reputation. Want to simple five-ingredient, 15-minute Honey Harissa Roasted Carrots recipe? Let’s do it! 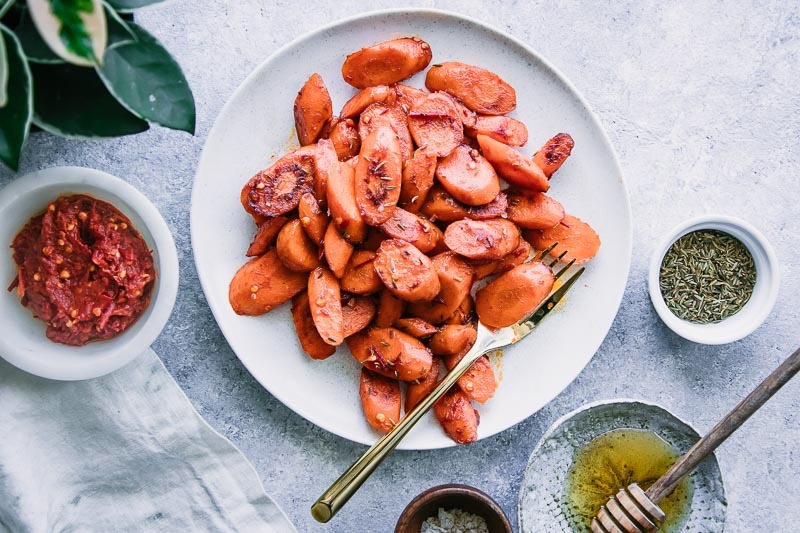 This Honey Harissa Roasted Carrots recipe is a simple five-ingredient recipe that comes together in under fifteen minutes, making it a great option for easy weeknights or fancy holiday dinners alike. To make this sweet and spicy carrot side dish, first you’ll peel and trim the ends off of your carrots and then slice. 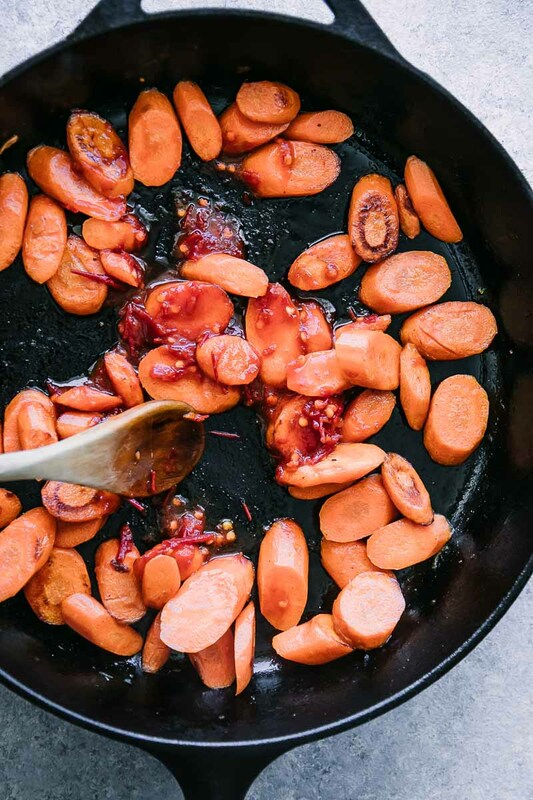 Add carrot slices to a large cast iron skillet heated over medium-high heat with a little olive oil. Roast the carrots in the pan until they’re beginning to soften, about 7-10 minutes, making sure to stir frequently to brown on all sides. Mix together the honey and harissa with a small amount of water to make the sweet and spicy sauce. 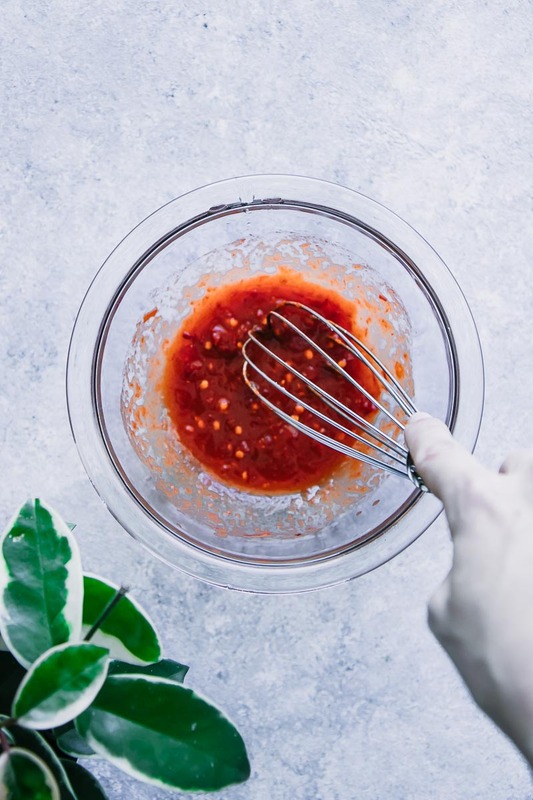 Meanwhile, add harissa sauce, honey, and a bit of water to a small mixing bowl and whisk together until well combined. Pour the sauce over the carrots and toss to coat, cooking 1-2 minutes more. Finally, remove carrots to a plate and top with a sprinkle of cumin seed and flaked sea salt. Enjoy! Pour the sauce in the pan with the roasted carrots and stir to combine. Then enjoy! Make it a full meal: while this carrot recipe is healthy, make it a complete by pairing it with a lean protein, a side of whole grains, and a healthy fat for a balanced meal. Love this simple pan roasted carrots recipe? Check out our other simple vegetable side dish recipes, like this Honey Citrus Carrot Salad or Turnip Carrot Cakes. 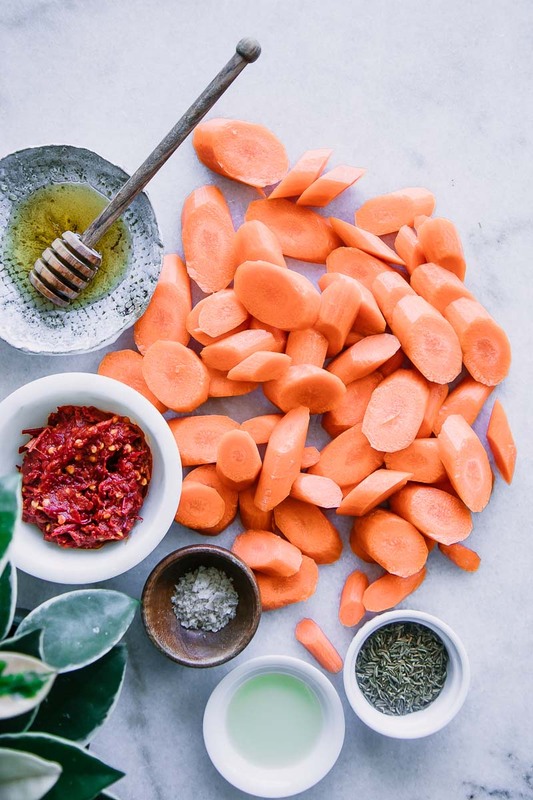 Did you make this Honey Harissa Roasted Carrots recipe? Leave a comment below and rate the recipe to let us know how it turned out. 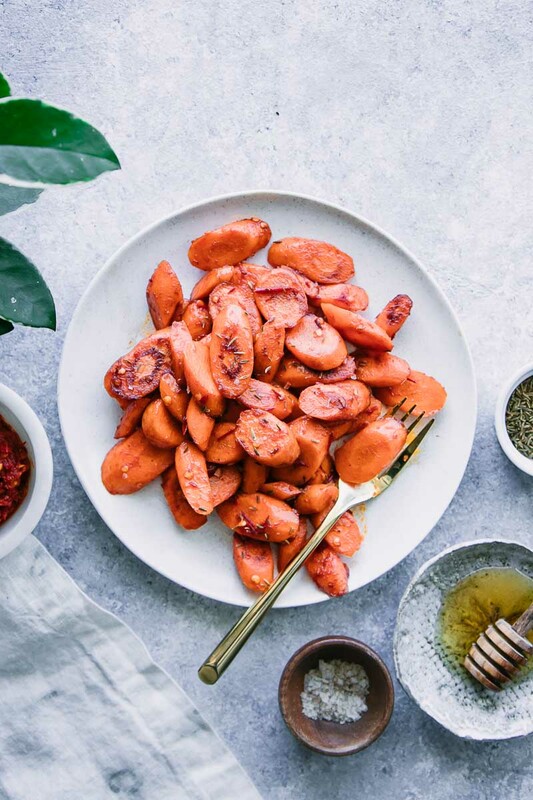 Save this simple roasted carrots recipe for later by pinning to your favorite winter Pinterest board and make sure to tag me on Fork in the Road’s Instagram to show me your carrot creations! I make something really similar to this with carrots and maple syrup and a bit of spicy sauce. It’s really simple and my kids love it. That’s great to hear! I think carrots are an underrated vegetable and they deserve much more love than just being a vehicle for hummus or other dips. Thanks for stopping by!